Santa Croce Basilica is the largest Franciscan church in the world. This is a beautiful and historic basilica. It dates back to the thirteenth century. Wealthy Florentine families funded the construction. 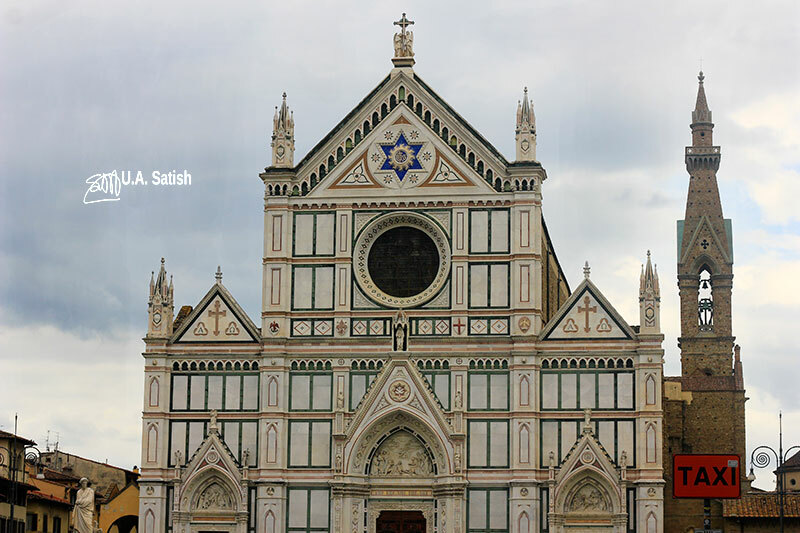 It is a vast church and well-known for its Florentine art. Erection of the church took years to complete. Sir Francis Sloane, English benefactor, added the marble facade to the church exterior in 1863. The flood of 1966 damaged the basilica. Waters of River Arno entered the church and devastated the building and art treasures. Restoration work lasted many years. The main chapel has soaring walls. 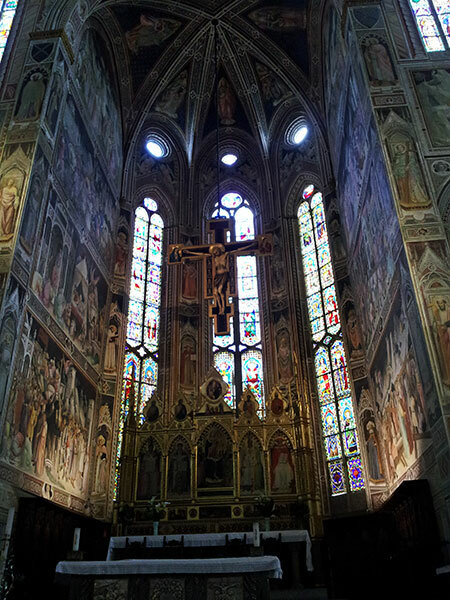 Agnolo Gaddi frescoed the walls. The beautiful stained glass windows were also his work. The church contains sixteen chapels. Well-to-do families built the chapels and had the honour of decorating them. The works of several Florentine masters are on display. 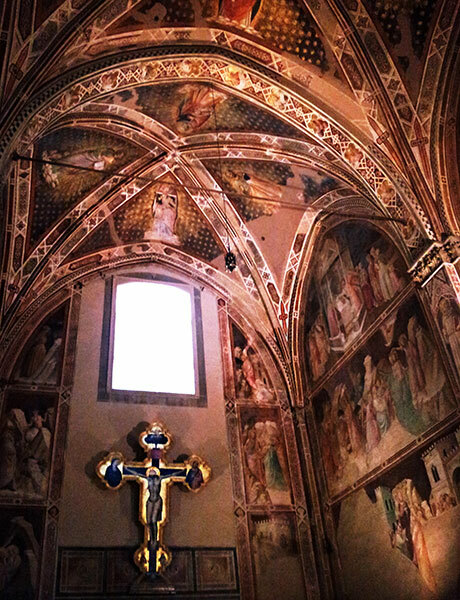 On the walls are frescoes by Italian masters: Giotto, Donatello and Toddeo Gaddi. Donatello’s hand-carved bas-relief in soft stone hangs on the church wall. His version of the Annunciation shows the angel Gabriel kneeling in front of Virgin Mary. Donatello has richly decorated the stone with gilding. 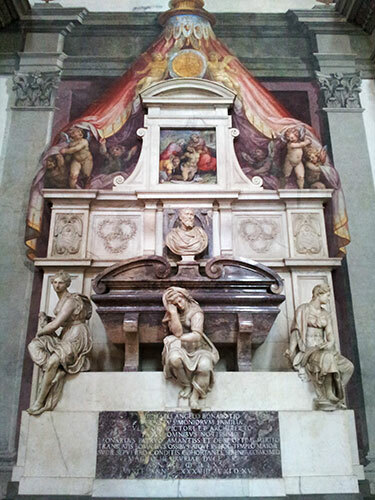 The tombs of some Italian greats can be found here: Michelangelo, Galileo, Machiavelli, Rossini and others. After construction of Michelangelo’s tomb, the basilica became a favourite resting place of Italian greats. Michelangelo died in 1564 in Rome. His mortal remains were carried to Florence for burial. 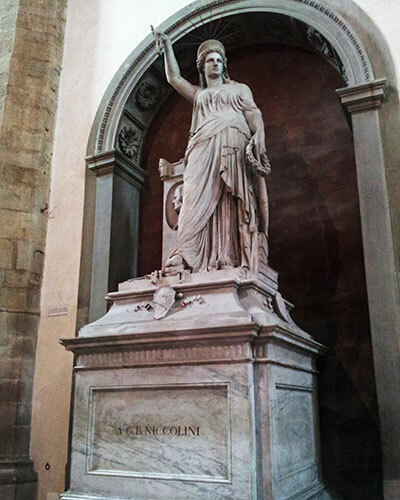 Giorgio Vasari designed the burial site. The monument to poet Giovann Battista Niccolini has an interesting sculpture. Pio Fedi’s sculpture embodies the Liberty of Poetry. It closely resembles the Statue of Liberty in New York. 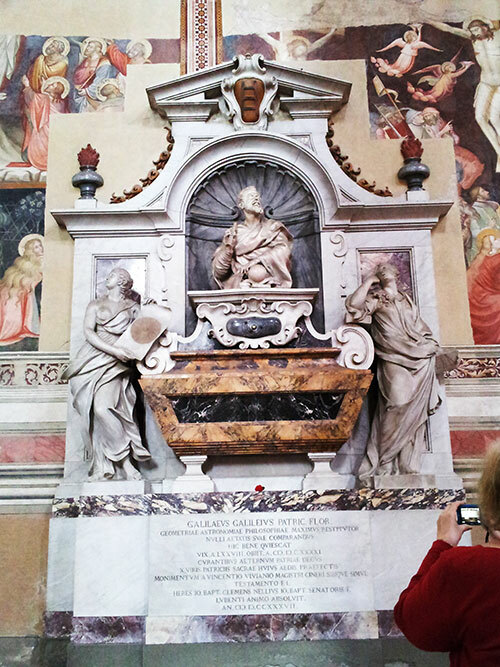 The mortal remains of Galileo rest in Santa Croce Basilica. His belief about the earth revolving around the sun stirred controversies in his time. 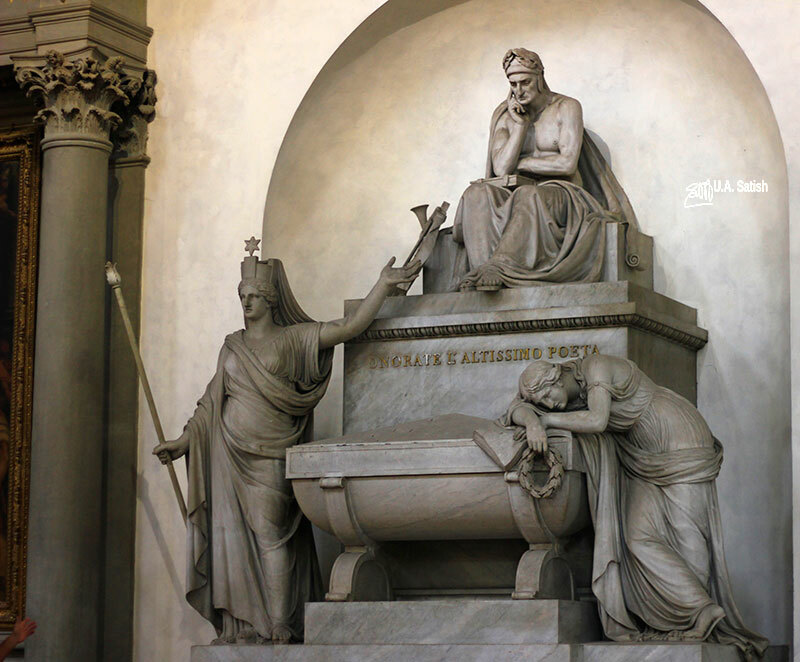 The Monument for Dante Alighieri is not a tomb but a cenotaph. This is an empty monument where the mortal remains are elsewhere. 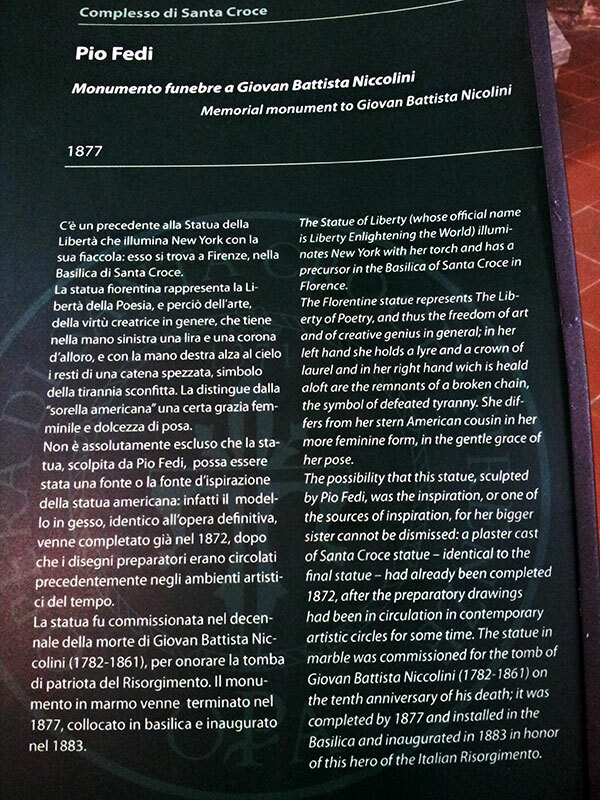 We could also see commemorative plaques assigned to Leonardo da Vinci and Marconi. The basilica is walking distance from Florence’s SMN railway station. Entry tickets cost Euro 8 per person. Opening times are 9:30 am – 5:30 pm. On Sundays it is 2:00 pm – 5:30 pm.